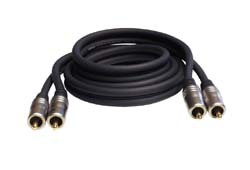 Profigold PROV5010 10m Composite Video Cable. Pearlized chrome plated metal connector with metal inner case, for maximum reduction of RF/EMI interference. Color coded plugs with silver soldering, for easy installation and minimum transition resistance. Superior large gauge conductors, for full performance up to 20 meters. Multiple shielding, for maximum protection from RF/EMI interference. Interference Absorption technology, to absorb electro Magnic and Radio Frequency interference. Integrated cable stopper, for optimal cable management.